Robert Bruce Cotton was once thought to be the ancestor of John Cotton of Queens Creek, York County, Virginia. However, some now speculate that his father might be John or Henry Cotton, London merchants and half-brothers of Sir Robert Bruce Cotton who purchased Broughton Hall in the county of Northampton, England. Could this be "our" Ann? and Ann Dunbar first appear together in Drummond's 1661 headright application. Then in Nov. 1666, John Paine applied for a headright for 18 people and listed John Cotton and Ann Dunbar side by side. In 1667, John Weire and Robert Paine applied for headrights for 24 people. Many of the names are the same as in the two previously mentioned applications, but John Cotton's and Ann Dunbar's names are transposed as John Dunbar and Ann Cotton. None of the other names were switched around like this. That mistake might suggest that these two people were thought of as a pair. family. He would be about the right age to be the father of John Cotton of York Co., VA.
dated Nov. 1657. Another is Eleanor (Elison) (Comins) Wheeler, whose will John Cotton witnessed in 1660 and who left Cotton a gold seal ring in that will. I have no idea what the significance of this ring might be. Her second husband Francis Wheeler was either a London merchant or the son of a London merchant. None of this may lead anywhere, but you never know. The Cotten Family is another tribe that settled originally on Queen's Creek in York County, Virginia, then shifted to Isle of Wight and Nansemond and finally poured its descendants in the third and fourth generations into the nmaw of Old Albemarle in North Carolina. Rev. William Cotten, minster of Hungar's Parish in Accomac County, if not the ancestor was a close collateral relative to the Cottens who settled in York County. But for the fact that Reverend Cotten's chronicler's wholly fail to refer to any children he had, save Verlinda Cotten, who married William Stone who became Governor of Maryland, we would say that John, Thomas, and William Cotten of York County, were his sons. Reverend Cotten married Ann Graves, daughter of the ancient planter, Thomas Graves, who was without doubt the grandfather of Ralph Graves who married the daughter of Joseph Croshaw, of Queen's Creek in York. Martin Palmer married the widow of Captain Benjamin Croshaw, and in 1660 Edward Palmer whose name appears often in the Isle of Wight Records, was a member of the Coroner's Jury in York County (D. and W. Book 8, p. 1) and in 1677 Martin Palmer served on the jury in York County in the case of John Cotton v. John Harris, et al. (Book 6, p. 26). 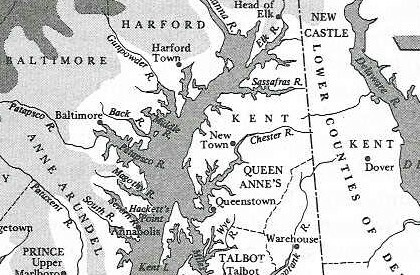 Joseph Croshaw was the adjoining neighbor of John, William, Phillip and Richard Thomas on Queen's Creek, the Eastern Shore in the immediate neighborhood of the Hungar's Parish Church, of which Rev. William Cotten was minister (Eugent p. 285). As late as 1661, William Drumond, afterwards appointed by Sir William Berkeley the first Governor of Old Albemarle, N.C. used the headright of John Thomas and many prominent and wealthy notables, who are known never to have lived in Westmoreland County in taking up a patent to 4750 acres of land (Nugent pp. 403-4). Then again on January 30, 1650, Captain Francis Wheeler had died, and his estate was appraised by Christopher Harris, Robert Harrison, John Stampe and John Cotten. Christopher Harris was a wealthy planter, who eventually returned to England, where he died; Robert Harrison married Elizabeth Comins, daughter of Nicholas Comins, and was the ancestor of the Harrisons of South of the James who married into the Thomas Family, and Captain Francis Wheeler had married the widow of Nicholas Comins, John Stampe lived in York County at that time, but his brother or son, Thomas Stampe was the head of a prominent neighbor of William Boddie, the Jordans, Lawrences, Exums, and others, along Currituck in Nansemond and Isle of Wight County. All of the appraisers and parties mentioned owned lands on Queens Creek with John Thomas, Nicholas Jernew, Joseph Croshaw, the Bennetts and Harrisons in York, and it follows that John Cotten was also of that neighborhood. This compiler has no shadow of doubt but that the John Cotten who married Martha Godwin and left a will in Bertie County, N.C. in 1728 was a son, nephew or other close relative of this Queens Creek John Cotten." Capt. John Thomas who married Anne Cotten, and his brother Richard Thomas is believed to have married Barsheba Wills, sister of Richard Wills who married Priscilla Cotten. Cavaliers and Pioneers, Patent Book No. 6, p. 19: MAJOR JNO. WEIRE 7 MR. ROBERT PAINE, 1185 acs., N. side of Rappa. Riv., nere Nanzaticon, beg. about half a mile from the river on the W. side of the Cr. nere a path, nere an Isle of sunken land on the mouth of a valley &c. 27 Sept. 1667, p. 64. Trans. of 24 pers: Rich Harman, An Cotten, Jno. Dunbar, Henry Mayes, James White, Sm. Evans,Rich. Symmonds, Wm. Coppage, Stephen Sadler, Mary Perry, Eli. Day, Jno. Savage, Wm. Harte, Tho. Parsons, Mary Harte, Saml. Price, James House, Walter Haines, Ralph Holt, Jon. Wilkins, Tho. Footer, Wm. Davis, Sy Croft, Martin Hide. RE this e-mail from the past! This link shows a picture of the house in question which has ‘CH’ inscribed on the side. on Yardley Gobion. I notice you are wondering who C.H. of Yardley is. and the date 1667 on it.